Product Demos/Videos: *System Requirements: Adobe Flash Player 8.0 or higher. 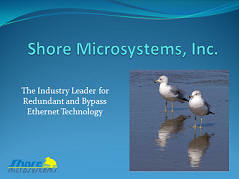 This demo provides a narrated guide to various aspects of Shore's Network Protection Chassis and the solutions it can provide to current and future customers. To view our 7-minute demo, Click Here or on the image to launch the demo. 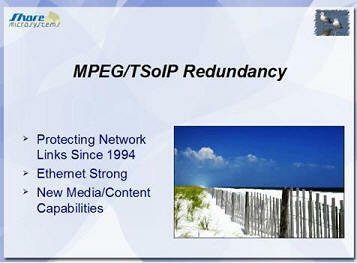 This web cast provides a narrated guide on another networking problem solved by using Span Port Replication on Shore's Network Protection Chassis. To view our 5-minute demo, Click Here or on the image to launch the demo. 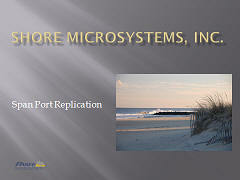 Shore Microsystems' Tech Talks Segment: a discussion on MPEG/TSoIP Redundancy using Shore's Network Protection Chassis. To view our 12-minute video, Click Here or on the image to launch the segment. Note: You will be redirected to YouTube.com.